“All work and no play makes Jack a Dull Boy”…and if Jack was a dentist, he REALLY would deserve a vacation! That is one reason that South Florida Cosmetic Dentistry Cosmetic Dentist, Dr. Charles Nottingham, DDS, took a cruise with the family to the beautiful islands of The Bahamas. At South Florida Cosmetic Dentistry, we have several patients that travel to us from The Bahamas to come have their cosmetic dental work done in our office. We were lucky enough to have one of our patients, who works for the Ministry of Tourism in the Bahamas, give us some great advice on where to visit. We arrived by cruiseship at the Capital City of Nassau, which is located on New Providence Island. This is the islands busy downtown district. This area is bustling with commerce, shops, flea markets, and even a local Starbuck’s coffee shop. All of the local vendors are dislpaying their crafts, and liscenced hair braiders are there to have you leaving looking like a native islander. We took a 10-minute water taxi ride over to New Providence’s neighboring island, Paradise Island. Paradise Island is home to the unparalleled Atlantis Resort. 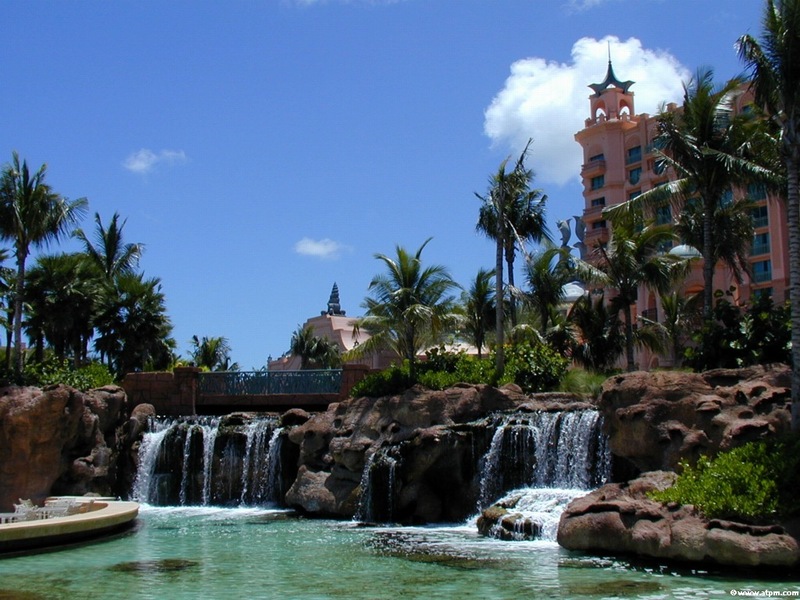 The Atlantis is an all-inclusive resort with a full casino, water park, aquarium, stores, beaches, and dolphin lagoon. On this tour, we had an amazing free lance tour guide that explained all of the local sites and even showed us where some celebrities have private homes on the island. When we arrived in Paradise Island, we were interested to learn that in The Bahamas, they drive on the left side of the road, like in England. We departed from the water taxi to find a charming little village of pastel colored shops and eateries, pointing the way towards Atlantis. Atlantis was nothing short of amazing–just as we were expecting! We had the pleasure of visiting the casino, and the upscale shops, before entering the guest check-in area. This is no ordinary hotel. The main lobby features cascading staircases surrounded by fountains and an underground view of some of the famous aquarium viewing tanks. Here, you can get an upclose glimpse of some of the underwater creatures like sharks, manarays, and jellyfish. The fun really began when we ventured into the resorts on-site water park, Aquaventure. The best time I had was being thrown against the rocks and tipped over in my innertube on the Rapids Ride. What fun! The entire family spent a great day doing all of the activities that Atlantis had to offer, including relaxing and soaking up some rays by the large pool. When the day was over, we all headed back to the ship exhausted from our fun-filled day in The Bahamas. The only thing that was missed on the way out was my purchase of a delicious Tortuga Rum Cake (although we did manage to sneak a tasty sample)! To book your next vacation to The Bahamas, contact the Ministry of Tourism. To book your next appointment with South Florida Cosmetic Dentistry, call us at (888)803-6337, or visit us on the web today!